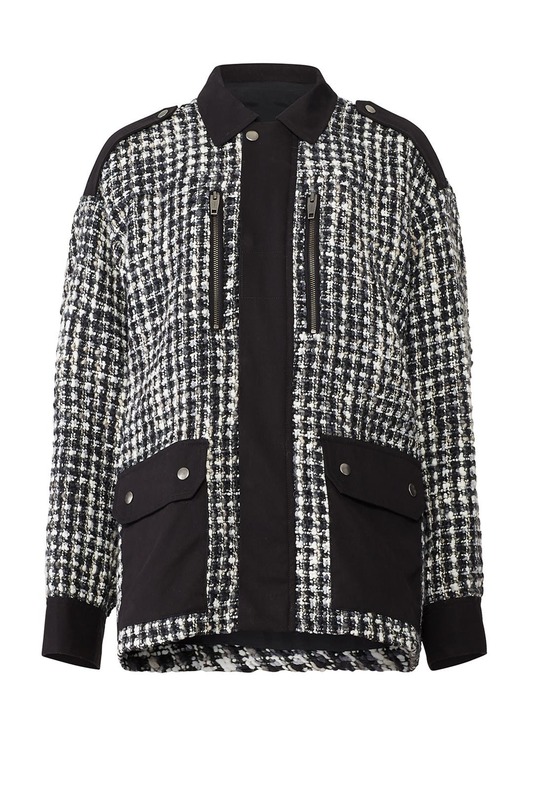 Classic tweed goes subtly sporty in this modern-cool jacket from The Kooples. Pair it with Rebecca Minkoff's Medium Ring Satchel. 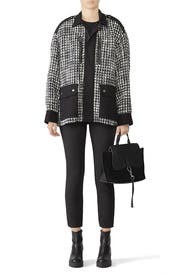 Black and white tweed (51% Acrylic, 38% Wool, 6% Polyester, 4% Polyamide, 1% Elastane). Jacket. Long sleeves. Hidden front zipper with snap closures. Pockets. 30" from shoulder to hemline. Imported. I love this jacket. 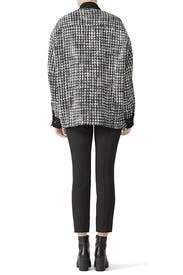 It's definitely oversized, but great for layering as we approach winter. I was down with the oversized look, but this just lays all weird and it's not flattering or chic. It just didn't fit right and I'm pretty straight and narrow. It should just lay flat and hang, but it was lumpy and sticking up in places. Disappointed. 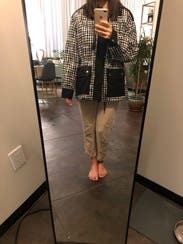 Even though the jacket was a little large, I love that the chunky knit textures added interest to my wardrobe. The first time I wore this, I got many compliments. I wore it with dark neutrals so that the jacket can speak for itself. This immediately elevated any basic attire. 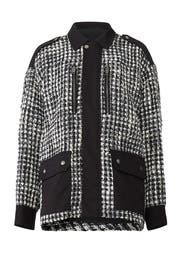 Love this jacket and received many compliments. Great for work!